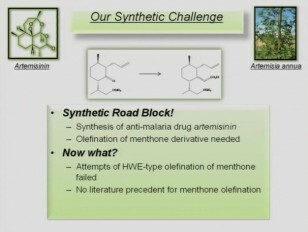 Etherification and olefination reactions play an important role in synthetic organic chemistry on a daily basis. As organic chemists we apply these methods to tackle synthetic targets of ever increasing complexity. As a graduate student in the Dudley lab at Florida State University since June of 2006, I have had the opportunity to work on 2 different projects that have dealt with advancing and improving on the methodology of etherification and olefination reactions. The more current of the two projects, recently published in the Beilstein Journal of Organic Chemistry (Lopez, S.S.; Dudley, G.B. ; Beilstein J. Org. Chem. 2008, 4, No. 44. doi:10.3762/bjoc.4.44), describes an efficient and convenient protocol for the in situ formation of benzyl ethers and esters using 2-benzyloxyprydine. The latter portion of the talk focuses on the advancements and improvements we have made to the Lewis acid catalyzed Meyer-Schuster rearrangement (Engel, D.A. ; Lopez, S.S.; Dudley, G.B. Tetrahedron. 2008, 64, 6988 invited contribution/ Lopez, S.S; Engel, D.A. ; Dudley, G.B. Synlett., 2007, 64, 949) which we have efficiently used to olefinate hindered ketones as well as aldehydes.